Can you believe it’s already October? Less than one month until November and Adoption Month will be upon us! Last year I devoted the whole month of November to adoption stories, and it was such a success, I want to do it again this year! Get ready for a whole 30 days of stories that honor adoption…Birth mothers, adoptive mothers, adoptees, or anyone listed above or forgotten that either play a role in helping to support adoption or has been touched by it in some way. Adoption is one of my favorite causes to champion for. There is nothing more beautiful to me than the strong mothers who make up the two sides of adoption. First, the woman who makes the brave choice to give life and a future to a child, and then hand him or her over to another. And secondly, the woman who receives that baby to love and raise as if it were her own flesh and blood. Both are mothers and both deserve to have a whole month to celebrate their roles. Of course there are so many other influencing components in the complexity of adoption…the adoptee themselves, siblings, aunts and uncles and grandparents on both sides, adoption counselors, agencies, legal team and caseworkers. The list can go on and on. Adoption touches so many different people and in many diverse ways. If you or someone you know has a story of adoption or works for or has been impacted by a reputable adoption organization that they would like to share about on M2M during the month of November, please contact me, I would love to feature them! You can email me at wynter@madetomother.com. What a terrific idea to share adoption stories and show readers both sides of the story! Inspiring and incredibly important to spread. Blessings! My youngest son’s best friend is an adopted child, and I will be forever grateful to his parents for bringing him into our lives. 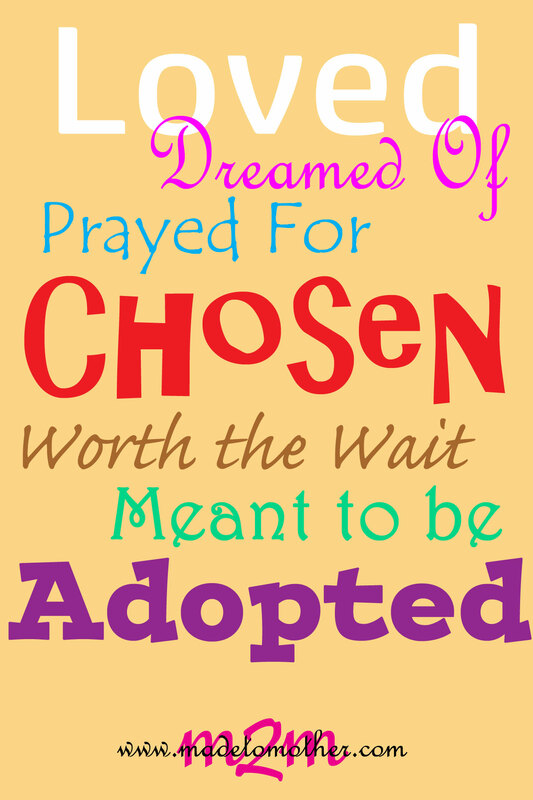 Wow this is so very cool – I’m an adoptive mom and I didn’t even know November was National Adoption Month. How did I miss this? Will be back for sure! Thank you for your interesting story about Adoption Month and the stories you will feature in November. Our Pastor and his wife just completed their adoption of their Foster Daughter. She is five years old and has been with them several years. Thanks for sharing with us here at Tell me a Story. We had our Foster daughter with us from age 12 to 18 and she says we are her real Mom and Dad. We feel the same about her. A beautiful idea for so many who have adopted children of all ages, for those who were adopted, and for those of us who know that we have been adopted into the family of God. I am grateful. Every month is Adoption Month for the last one!! : ) Glad you are my neighbor at Jennifer’s tonight. What a beautiful thought! I would love to see it expanded on… I’ll PM you! I came over on Wise Woman today, and I’m glad to find your site. Love that are celebrating adoption! We have several friends who are seeking to adopt right now. Praying for God to give them children! Thanks so much for championing this worthy cause, Wynter! I hope you have a super blessed week! Dropping by from Wise Woman. We are an adoption family. Our daughter came to us through foster care. Definitely knit together in heaven. Such a beautiful story. Thanks for linking up with Thursday Favorite Things!